Michael Melvin of Starr’s Mill High with (R) Principal Audrey Toney and Fayette County Public Schools Social Studies Coordinator Cathy Geis. Two years in a row, the Georgia Council on Economic Education has selected a Fayette County teacher as the Georgia Economics Teacher of the Year. 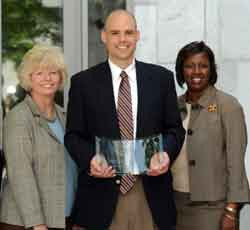 Michael Melvin of Starr’s Mill High has received the 2010 award. He helped coach the 2009 Starr’s Mill Economics Challenge team to a third place finish at the national competition, a first in the Fayette County Public School System’s history. Nominees for the award must be teachers in either public or independent schools in Georgia who are either teaching a course in economics or integrating economics into their courses at any grade level, K-12. Teachers must demonstrate knowledge of economics appropriate to the grade level or courses being taught, an ability and willingness to use a variety of appropriate methods and resources in teaching economics, and enthusiasm and creativity in teaching economics. Last year’s winner was Shelby Garner of Spring Hill Elementary. Since 1998, a total of six Fayette County teachers have received the prestigious award.